Drug store, Over the counter, Medications, Pet Medications, Prescription Drugs, Health Supplements, Vitamins, Tylenol, Motrin, Air Borne, Pharmacist, Refillrx, Diabetes, Insulin, Claritin, Pet Meds, Online refill, Locally Owned, First Aid Kits, Bandages, etc. We’re your friendly neighborhood pharmacy. We combine support, care and counseling for medication needed to treat chronic, complex medical conditions. Have your doctor Fax, or Call in your prescription to help reduce wait time when you get here. (30 days, 60 days or 90 days supplies available on most plans). 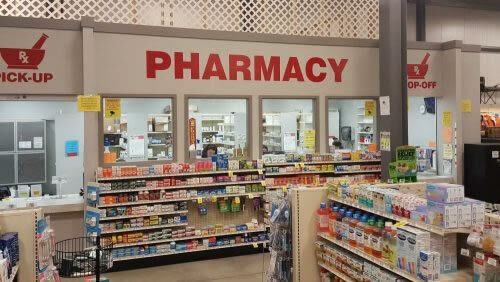 – Our large staff and inventory allow us to dispense most prescriptions in 20 minutes or less (except new customers). – Our pharmacists are available to sit down with you to discuss your medications, help to answer any medical questions you may have, or recommend over the counter solutions. – Discuss synchronizing your medications for fewer trips to the pharmacy each month. 3950 S. Knik Goose Bay Rd.